Looking toward the west side of Edgewater Village, where 28 townhouses are to be built. 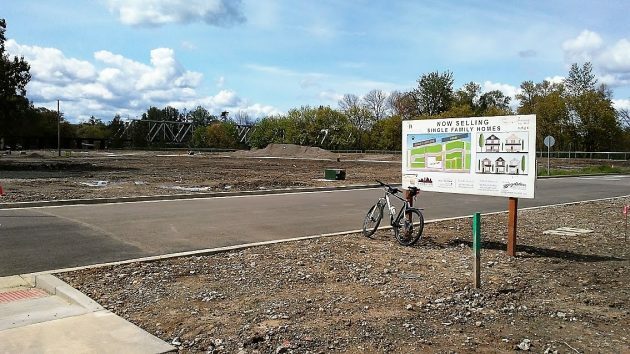 Edgewater Village, the subdivision on Albany’s formerly industrial riverfront, is making arrangements to step up the pace of home construction after the Albany urban renewal board approved a change in its loan agreement with the developers. The developers, George and Paula Diamond, have hired the Baldwin construction company to build 28 atttached townhomes and four detached houses in the project. Construction may start in June, and for the sake of efficiency the plan is to build all 32 units in groups of several at a time. The Diamonds have commitments for a $6 million construction loan from Washington Federal for the 28 townhouses and a second loan of $1 million-plus, from First Republic Bank, for the four remaining detached houses along the riverfront Dave Clark Path. (Two houses along the path have been completed and have families living in them, as have 13 other houses.) Another loan from First Republic, for about $2.6 million, would finance an additional 11 single-family houses called for in the Edgewater plan. To make way for the additional bank loans to the Diamonds, the advisory board of the Central Albany Revitalization Area on Wednesday agreed to subordinate CARA’s earlier loan to the development. If the project goes bust, the banks will have the right to collect from the Diamonds before the city can try the same. In their memo on all this to the CARA board, the Diamonds pointed out that the already completed 15 homes in Edgewater pay a total of more than $60,000 in property taxes. A check of county tax records shows the properties each have annual tax bills of about $4,000 or above. Albany lost serious ambiance when construction crews carted off the destroyed concrete buildings which formerly decorated the riverfront. The towering, abandoned grain elevators and the crumbling, vermin-infested warehouses created a “big city” atmosphere in what is essentially a small town. You simply cannot recreate that sensibility. Now all we have is government-subsidized cracker box condos. It would appear as though Albany has lost far more than it has gained. Betting this is in invisible sarcasm font. Nothing says urban blight like semi-decayed relics of a long-gone but peosperous past. Since nobody owns the property, nobody cares for it or pays taxes. Next thing ya know, homeless and vermin move in. That scares the neighbors, who demand that SOMETHING be done. To the “nattering nabobs of negativity” (always liked that phrase) : if you don’t like this answer, what was your solution? Who knew there was so much news in Albany. You certainly know where to ride and pass on news we would never receive in the paper. Edgewater still seems a less than optimum place to purchase a home. Don’t think having to cross an operating railroad track and be near a brewpub traffic is a rational choice for residences. I’m sure Tom would consider his neighborhood a much more than optimal area to purchase a home, of course. Cleaning up a funky city water front is tough work. The Diamonds could’ve bailed at any point but kept up their part of the deal and I commend them for that. We, Boydston Construction, built those first 15 homes for Edgewater and I can honestly say I wondered if the whole project was ever going to fly. And now I can say it has. Several homes have sold and the people I’ve talked to say they like it there. In fact one retired couple from the S.F. Bay area moved there and are very happy. So maybe it’s not a perfect deal but the end result will be good and Albany will be be a better place to live because of it. Thank you Jerry Boydston for your your forward thinking comment!!! In the end it will be a much better place to live! I just wish more people could see the benefits!